Have you ever been on a vacation to another country and been blown away by all of the amazing and unique designers that you see? I once went into debt on a college trip to Europe because I found so many amazing pieces that I couldn't pass by. I remember thinking that I'll never be back here again (this was during my broke student days). Fast forward over ten years later and there is now a "fashion hub" that connects emerging designers around the world to customers everywhere. Meet Runway Passport, where fashion around the world can be discovered from your own living room. Discover rare and unique fashion finds from Ethiopia, to Germany, to Brooklyn, NY. There is something for everyone at this unique shopping experience. With their impending launch this month, I interviewed the founder/CEO Liz Entin to get a little more insight about her company and how she came up with such an amazing idea. GG: Runway Passport is such great idea for a shopping site! How did you come up such a unique idea? Elizabeth: "Thank you! Its been so exciting to bring people who really are passionate about their personal style a central hub where they can shop and discover new designers from all around the world. And hopefully find their new favorite! 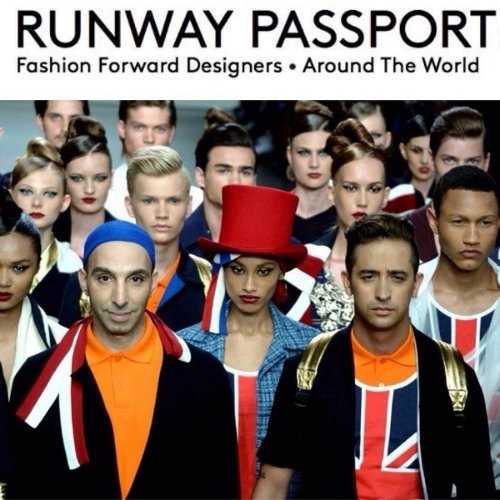 We just launched Runway Passport this August! My main passion always was finding new unknown designers and I noticed there wasn’t much of an outlet for them. It was on a trip to Thailand where the idea really came together. At first we were a content site which covered fashion weeks all around the world. After a realization that that model still left off designers who didn’t have a fashion show, left off the more wearable pieces, and still didn’t give people the opportunity to actually purchase these pieces, we decided to pull back and rebuild/relaunch as an e-commerce site for people to discover a new favorite designer and statement piece"
We try to be very diverse in our choice of designers and not stick to one aesthetic since our customers are all very fashion forward and have their own unique sense of style. What's your career background? Did you come from the fashion world? How did you become interested in fashion? "I have always loved fashion! My whole life I found it a daily creative outlet and have loved the feeling of wearing and personally interpreting someone else’s creations. When I was little I used to sew dolls clothes and make them all these really creative outfits. I also loved dress up and decorating anything including my room nd dollhouse. When I grew up I began assisting fashion stylists and styling shoots for magazines." How do you find these unique designers across the world? "Each one comes to me through a different way. We have local curators who are really in on the fashion scene in their country. Some find us and some one of the team will come across online, on instagram, Facebook etc. We try to be very diverse in our choice of designers and not stick to one aesthetic since our customers are all very fashion forward and have their own unique sense of style. We want to give them access and allow them to make their own style choices - not choose for them." What's a typical day like for Runway Passport? "Omg - every day is so different I could never answer that!" Assuming you use drop ship type of method, how exactly does a customer receive product from another country? "It comes directly from the designer to the customer." GG: If you could give one piece of advice for a young entrepreneur what it would it be? "Stick with it.. fulfilling your dream and it isn’t supposed to be easy. You definitely need stamina, passion, excitement and a constant daily slow steady commitment." Do you have any fashion icons or heroes that you look up to in fashion or business? "Oh wow so many. First of all all of the designers out there who have a strong vision they are sticking with and working hard everyday to share - because they love it. Being a designer (especially an emerging one) is so tough and anyone who is diving in and doing it is a hero of mine. Then I have to say - same as probably most people - Diana Vreeland Carine Roitfeld and Anna Wintour." Your favorite place to shop, or designers? "Sorry have to say Runway Passport - I know I am a bit biased!" What does the future look like for Runway Passport? Where do you see the business in the next 5 years? "We just want to keep expanding and offering people who love fashion a real choice of designers regardless of where the designer is from or how early in their career they are. (both of which limit people’s access to have a full opportunity to discover their new favorite designer)"